Atari User Issue 19 is out. This issue we have exclusive interviews with Bill Hogue (Miner 2049er fame), and the man himself - Nolan Bushnell. 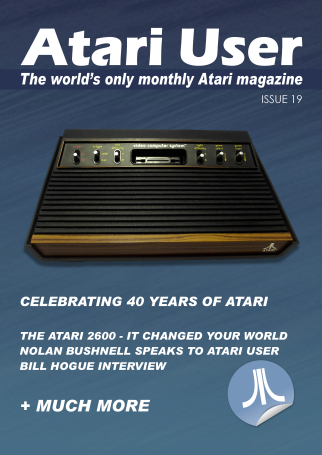 Also this issue, we celebrate the Atari 2600, have an expanded homebrew column, look at Tennis on the various Atari platforms, and much more including : Retrovision report, ST Coin-OP Conversions, we look at another month in Atari history plus more reviews. A big thank you to Bill Hogue, Nolan Bushnell and everyone who worked on this issue! Subscribers should already have received their download links. If for some reason you haven't received yours then please PM me. The latest issue is available in print and PDF digital download. For more details, visit http://www.atariuser.com . OK. everyone should have their copy of the mag now. Great read, especially the Nolan interview. Thanks Stephen. Nolan and Bill Hogue both were fantastic. We've got another special interview lined up for the next issue.